People have been making natural wood stains for thousands of years, using colors derived from many everyday sources -- soils, clay, flowers, bark, nuts and other items found in nature. In order to make your own “natural” wood stain, you have to define “natural. Natural wood stains provide subtler, less intense colors than manufactured products. People have been making natural wood stains for thousands of years, using colors derived from many everyday sources -- soils, clay, flowers, bark, nuts and other items found in nature. In order to make your own “natural” wood stain, you have to define “natural” Truly natural stains might prohibit the use of such compounds as vinegar or ammonia. Although occurring naturally in the atmosphere and in soils, ammonia would be nearly impossible and extremely hazardous to produce yourself. Modern pigments, too, are almost always synthetic. But you can produce natural wood stains of varying color depth. Soak iron nails in a bowl of vinegar for a few days. Of course, nails aren’t purely “natural,” and store-bought vinegar may contain additives, but mining your own iron and producing acetic acid by fermenting ethanol probably is a bit too natural for most people, so using nails and vinegar should qualify as a “natural” process. This process will produce a gray or reddish-brown stain, depending on the iron content of the nails and how long you soak them. You also can allow the vinegar to partially evaporate to intensify the color. Soak tobacco (chewing tobacco works well) in water and ammonia. Measure out equal amounts of ammonia and water and pour the mixture over a mound of tobacco in a bowl. Use a glass or plastic bowl. Metal will react with the vinegar in a metal bowl. Use just enough of the water-ammonia mixture to cover the tobacco. Let it soak for a couple days. This will produce a brown, even ebony, stain. Tea or walnut shells also can be used, or you can combine items to produce different shades. Dip a brush into the mixtures after you’ve achieved the color you want. Brush the mixture onto a piece of wood and allow it to dry. This natural method produces a fairly weak color -- not at all like the vibrant and intense colors found with synthetic pigments and manufactured stains. Depending on the type of wood to which you’re applying the stain, and how much stain you apply, you’ll get various results. 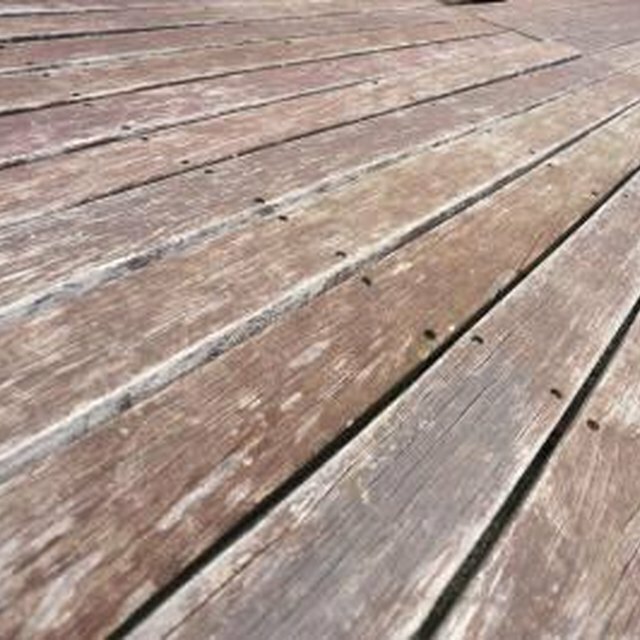 Fresh wood will produce richer, deeper colors. Older, dried wood will yield much subtler colors. Experiment with scrap pieces of wood before using this natural mixture on a piece of furniture or other cherished item. The colors can vary from a grayish color accompanied by a sheen-like quality to an almost black color. Produce an oil-based stain by using boiled linseed oil as the binder, mineral spirits or pure gum turpentine as the vehicle, and a natural or synthetic pigment for color. Linseed oil, mineral spirits and turpentine are natural items in that they are produced from items found in nature, with few or no additives. Mix a powdered pigment or a linseed-based artist’s pigment that comes in tubes and can be found at art supply stores into one cup mineral spirits or turpentine. Combine the turpentine-pigment mixture with two cups linseed oil. Finally, add about 1/8 teaspoon of Japan drier, which acts as a drying agent. Combine the mixture thoroughly before applying to wood. Use an air-tight container to store the liquid, and shake vigorously before each use. If using synthetic linseed-based pigments from a tube, you may not need to add a drier as many such products already contain Japan drier as a drying agent. You can experiment with many natural pigments on the market today. Organic and produced from natural items and compounds, these pigments can be found in any artist supply store. Try producing your own pigments by using items found in nature. Drying and crushing flower petals, rose petals for example, produces a natural pigment that can be combined with vehicles and binders to produce natural stains. Make sure to use a well-ventilated area when soaking the tobacco in ammonia, or soak the tobacco outdoors to avoid breathing in ammonia fumes. Produce an oil-based stain by using boiled linseed oil as the binder, mineral spirits or pure gum turpentine as the vehicle, and a natural or synthetic pigment for color. Linseed oil, mineral spirits and turpentine are natural items in that they are produced from items found in nature, with few or no additives. Mix a powdered pigment or a linseed-based artist’s pigment that comes in tubes and can be found at art supply stores into one cup mineral spirits or turpentine. Combine the turpentine-pigment mixture with two cups linseed oil. Finally, add about 1/8 teaspoon of Japan drier, which acts as a drying agent. Combine the mixture thoroughly before applying to wood. Use an air-tight container to store the liquid, and shake vigorously before each use. If using synthetic linseed-based pigments from a tube, you may not need to add a drier as many such products already contain Japan drier as a drying agent. You can experiment with many natural pigments on the market today. Organic and produced from natural items and compounds, these pigments can be found in any artist supply store. Try producing your own pigments by using items found in nature. Drying and crushing flower petals, rose petals for example, produces a natural pigment that can be combined with vehicles and binders to produce natural stains.